Luke Heady, men's basketball player and senior, looks to pass to a teammate. The basketball team prepares to play Hamilton Southeastern High School on Feb.8 at CHS. 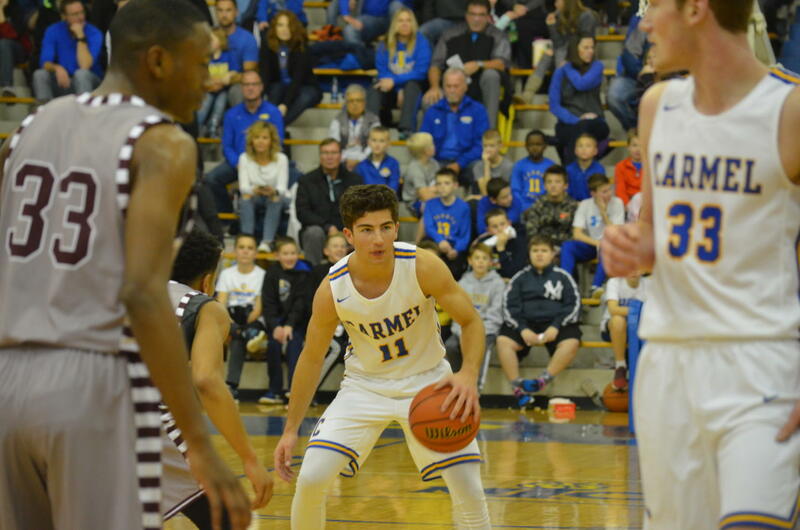 With few games remaining in their regular season, the junior varsity men’s basketball team will continue their schedule by playing Hamilton Southeastern High School at 6 p.m. at CHS on Feb. 8. With a week’s rest since their last game, which was against Lawrence North High School, the players should be fresh and well-rested for Hamilton SE. Homework. My life is sad. Sleep. Sleep. And more sleep. Elmore's World: Chris Elmore, staff member at WHJE and sophomore, edits his live radio broadcast while getting feedback to improve. Elmore talks about politics live every weekend on WHJE and has even brought in important people like Mayor Jim Brainard. Men's Track and Field: Samuel (Sam) Rogers, men's track runner and senior, completes a sprint during practice on March 19. The team's next contest will take them to Indiana University on March 23, where they will compete in the Hoosier State Relay Finals. Chinese Culture: Sophomore Owen Eckart listens to a presentation about the Chinese yo-yo during the NCHS's cultural immersion meeting after school on Mar 14, 2019. The NCHS has been hosting a multitude of Chinese cultural immersion presentations meant to spread an intrest in Chinese to anyone who would come to the meetings. In this specific meeting, headed by Treasurer Grace Hong, the history behind, and the way to use a Chinese yo-yo was shown. After the presentation, the guests were allowed to play with the yo-yos and discuss any other Chinese culture that they have experienced before. Bring It On: Sophomore Isabel Garcia practices her part in the upcoming school musical, on Mar 19, 2019. The upcoming musical is called "Bring It On" and is a musical that focuses on the competitive world of cheer-leading. The instructors, Kylie Barker and Samuel Chenoweth have been working with these students since Mar 4, and and the first showing of the musical will be on May 9 at 7 p.m.
Model Making: Sophomore Bradley Snyder holds his model skeleton after learning about muscles on March 18 during Human Body Systems class. Model skeletons allow students to be able to hand make parts of the body. Snyder has a passion for science and aspires to be a doctor when he is older. Human Body Systems is one of the many science classes offered to sophomores at Carmel High School. “Schoolmade” Pasta: To start off the fourth quarter, junior Alexa Barreras makes fresh pasta in her foreign foods class on Mar. 18 along with the other members of her group. This lab prepared the class for their field trip next class. A Foot Above The Rest: John Micheal Mulloy, varsity basketball player and senior, holds the ball before attempting a layup during their game against Fort Wayne Dwenger High School on February 20. Mulloy is the tallest student on the Carmel High School basketball team. Mulloy will be attending Butler University for basketball in the fall of next year. Body Building: Sophomore Ayla Dimon creates muscles located on the human body out of clay to put on her Mannekin in her Human Body Systems class on March 15. Dimon says that they use the Mannekins to learn where different body parts and organs are located on the human body and it helps her visualize where everything is located in her head. Weekend Ready: Junior Emma Uber shows off her comedy skills on March 14 at the end of a math class. Students are typically allowed to pack their school bags and talk with friends during last few minutes at the end of a class period. Uber says she loves to talk with her friends and make other people smile. Art for the Community: Lexi Carter, National Art Honor Society (NAHS) member and sophomore, works on a collaborative painting of lightning during a meeting on March 7. 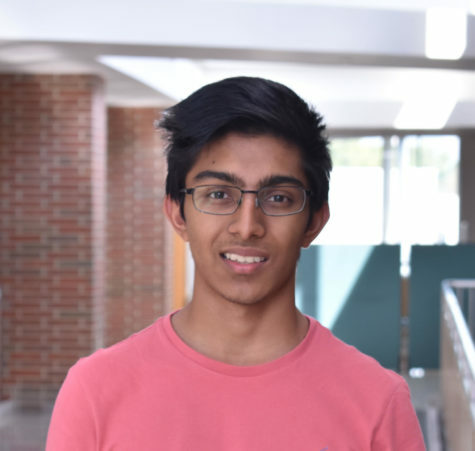 Carter said NAHS is a nationally organized club where students can apply to participate in art-centered projects to better their school and community. Poker Players: Senior Anna Novak leads a game of BS Poker on February 14th during her release period. Novak stated that this game was a more complicated rendition of Poker. Competition Prep: Junior Yannik Singh works on a vehicle during SRT on March 14. Singh, along with others, are preparing for the Science Olympiad state competition on March 16. Tassel: Junior Jess Greven talks about the rules of being a TASSEL VSEE instructor on March 11th after school at the Carmel Clay Public Library. Greven used a Powerpoint presentation to better teach the newly recruited instructors. Laser Focused: Senior Parker Jou plays a game during the Stats Carnival on Jan 11. Statistics students created carnival games to gather data for a project. Presentation Preparation: Sophomore Mary Grace Jacko (front) works on her English presentation in her Honors English 10 class with her partner sophomore Ivy Nugent (back) on March 12. Jacko plans to take AP Seminar next year and is excited for this presentation as it is formatted similarly to an AP Seminar presentation. Resource Time Rehearsal: Sophomores and Honors English 10 students, Abbey Grogan and Annie Surette, rehearse for their medical presentations the SRT before their class period. Honors English 10 students had spent the third quarter researching an issue in the medical field, and were then tasked with finding a solution to this problem. The concept of the presentation was based on the novel the students read, Brain on Fire, for the third quarter. Last Minute Work: Junior Erin Vest works on a computer in the media center during her lunch on Mar. 8. Vest said that she had a lot of work to finish during the past few weeks. Chemistry Class: CHS students studying for their chemistry test in Mr. Horner's B4 class. The students will all assess over molecular structure and geometry. Men's Basketball: Lucas (Luke) Heady, men’s basketball player and senior, chats with a young fan prior to the team’s game against Fishers on March 1. The final score was CHS 62, Fishers 52. Comedysportz: The Carmel Comedysportz team celebrates after the announcement that they have won their match on Feb 22 in the Carmel High School studio theater. The Comedysportz team participates in competitive improvisation games at local high schools, their next home match will be March 21 and 22 in the studio theater. Impromptu Interviews: CHTV reporter and junior Cameron Beteet records an interview for CHTV during SRT in the commons. Beteet moved the camera back and adjusted the settings to fit the interviewer and senior Ayanna Newhouse, interviewee and junior Emme Walschlager and interviewee and senior Charlie Hunter. Perfect Form: Students in Advanced Physical Conditioning work on their form for sprints on Feb. 27. The class consisted of student athletes, primarily those who play football, basketball and wrestle. Ceramics Creates Celebrities: Sophomore Natalie Hanna attempts to sculpt the face of the famous singer, Rihanna, in her ceramics 4 class. Each student in the class chose a celebrity they admire for this project to end the third quarter. Science Olympiad: Sophomore Annie Kim studies for the state Science Olympiad competition in Feb. 26. The team recently qualified for the state tournament after winning the Regional on Feb. 23. Men's Basketball: Men’s basketball player and senior Lucas (Luke) Heady dribbles down the court during the team’s game against Bishop Dwenger on Feb. 22. The final score was CHS 54, Bishop Dwenger 24. French Fun: During a game in French III on Feb. 21, Freshman Sarah Patel points to a possible answer choice on the board and whispers what she thinks the answer is to her partner, Sophomore Owen Gastineau. The objective of the game was to choose the right conduction of a verb in French and the team that won the most amount of points won a piece of candy. SRT in the Studio: Senior and AP Studio Art student, Nate Burgess, spends his SRT working on and touching up his landscape painting. Burgess said he has been involved in art at CHS since his freshman year and created a variety of works. Carmel Pep Band: Junior Julia Roth plays in CHS's pep band for the men's basketball Varsity game held on Feb. 15, 2019. CHS played against Warren High School and the game ended with a score of 69 to 52.. The Carmel Pep band plays in the breaks and intermissions of the game such as the beginning, timeouts, halftime, and at the end, playing songs such as Radioactive and Sweet Caroline. Carnation Conversation. : Senior Nora Helou talks with Senior Adelle Murphy during lunch about Valentine's Day. Adelle distributed the flowers to her friends as gifts. Carnation Sales: NHS member and senior Sai Pothireddy sells carnations for Valentine's Day in the Main Cafeteria on Feb. 6 during lunch. Other volunteers in NHS have planned to pass out the carnations on Feb. 13 during SRT. Smoothing the Edges: Freshman and Jewelry I student, Faith Knight, smooths the edges of her most recent project in SRT, January 28. Knight said that new jewelry students work on basic skills and apply them to their projects throughout the semester. GKOM Discussions: Sarah Snyder, GKOM member and junior, leads a discussion on Jan. 24 with her group of freshman. There were around 6 GKOM members per freshman SRT room. Accounting Assistance: Carmel Cafe employee and junior Faith Adamson helps her fellow cashier Nina Hecht on the iPad in the Cafe on Jan. 23. The Carmel Cafe opens at 7:15 a.m. every morning and is available as a space for students to purchase drinks, cookies and enjoy a quiet place to relax or work on homework. Cutting Carefully: Junior Sean Burgess uses a jig saw to cut a wood block for one of his projects. Burgess is in shop class on Blue Days during third period. Class Award Cookies: Students grab refreshments after attending the Class Awards meeting during SRT on Jan. 17. Students received class awards from teachers for exemplary work during the second grading period. Artistic Approach: Drawing 2 student and sophomore Colleen Sullivan works on a colored pencil drawing of her hand on Dec. 16. After the class completed several small sketches within the first few days of the semester, they moved on to planning their first major project, which featured foreshortening. Free Finals Period: Sophomore Jacob Olekszyk plays Super Smash Bros on his Nintendo Switch during a free period on finals week. Some students who are required to attend school find themselves with free time during at least one of their testing periods. While some students utilize this time to study and get ready for the next final, some will use this time to sit back and relax from their finals to take the stress off their minds.